Toronto Entrepreneur and Community Organizer who ran for Councillor in Ward 10 Spadina Forty-York with strong interest in Direct Democracy and Vote Reform. Having just met and talked to a number of wonderful residents on Denison Avenue, I report on their suggestions and summarize the (numerous and worrisome) news of the day. As you start walking on Denison Ave from Dundas St, you first find a “gentrification” poster, followed a few steps further down by a “revitalization” project poster. While researching this topic, I found a number of articles pointing to Alexandra Park following on Regent Park’s footsteps: TCHC, UrTor, CBC, Star. 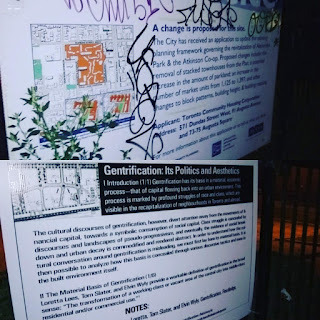 The news are generally positive and despite the “gentrification” poster, the people I spoke with were either happy with the project or insufficiently upset with it to talk about it. Perhaps the happiest was a poet and writer with whom I had a good conversation and who had translated “Oh, Canada” (our national anthem) into his native language. Another resident, graduate of a Political Science program, talked to me about Shirley Williams and her desire to devolve political decision-making both up (to supranational entities) and down (to grass-roots, in a nod to direct democracy) and how she felt that the nation-state is obsolete. I will save this for later research. He also expressed his dissatisfaction with Joe Cressy’s posturing and his consequent lack of time to effectively represent his constituents. Yet another resident suggested that bike lanes should be “amalgamated” on King Street, thus freeing space for car traffic on the many streets where bike lanes have cropped up. A second suggestion had to do with avoiding to set up injection sites next to an elementary school. He mentioned a location near Richmond and Bathurst where this has happened, but I was unable to find any reference to that in the news. What I did find was this having happened in Montreal on Ontario Street toward the end of 2017. Around the same time 3 injection sites opened in Toronto, and while articles in the Sun reflected concerns especially about Joe Cressy’s posturing, those in the Star tried to calm spirits down. About a month later, City TV reported on kids from St Michael’s Choir School taking reporters to an area with needles, steps away from The Works, Toronto’s first safe injection site on Victoria St, close to Yonge and Dundas. Again, in my view, even absent a general framework for residents to directly vote on city proposals affecting their community, a councillor is obligated to “take his constituents’ pulse” and represent their will, yet it does not seem that Joe Cressy, the incumbent, has been doing that. It is becoming increasingly difficult to follow the news. The word “unprecedented” was used by many to describe the events of the past couple of days. Doug Ford, the new Ontario premier and former 1-term Toronto City Councillor, passed a law (Bill 5) to reduce the number of Wards (and councillors) from 47 to 25, matching provincial and federal boundaries, while the election was ongoing. The City Council voted to take the Province to court (only 11 councillors supported Ford’s move), and won a decision annulling the law for infringing on Charter rights. Premier Ford immediately moved to pass a new law, this time invoking the “nuclear option” aka “notwithstanding clause” (Section 33) which allows Canadian governments to ignore such court findings. In so doing, Doug Ford encountered serious opposition, some principled and some not so much. He removed his critics (and even NDP, the official opposition) from the Provincial Legislature. It appears that his political base strongly and almost unanimously supports his moves. Brian Bird reminded us of the “judicial version” of said Clause. The new law (Bill 31) is expected to become effective on September 24, at which point there will be two additional days for nominations. That is partly because the MPPs will be attending a plowing match. Originally, advance polling was supposed to start on October 10 and the voting day was October 22. In the last election, a record 161,147 Torontonians voted in advance polls over five days (double the previous). A number of Councillors are no longer running, while others have yet to register their choice of Ward out of the new 25. The City Clerk has retained their own lawyer and stated that it is nearly impossible to hold an election under either scenario. It also appears that while the politics scene is consumed with this little tug of war, most people polled are concerned with housing affordability. It remains to be seen if these concerns will translate into actual votes. Legal experts have given some possible avenues of appeal. one possible legal route is to challenge the law by arguing it is an unlawful use of the clause, a claim that relies on the principle that no action in a constitutional democracy like Canada should be entirely immune from judicial review. There's also a notion posed by some scholars that the clause should only be proactive, not reactive. In other words, it can't be used to go back in time and change a piece of legislation. "In this case, it is retroactive. The legislation has already been passed, the decision's been made on it," said Joel Bakan, a professor of law at the Allard School of Law at the University of British Columbia. Another strategy could involve arguing against a key piece of Justice Edward Belobaba's scathing ruling, which deemed the legislation an infringement of the freedom of expression for both candidates and voters; in part because it was introduced partway through the election. Hasan said a "novel" approach would involve arguing Belobaba was wrong — that the bill actually violated the unwritten constitutional right to effective representation. Why go that route? Because the notwithstanding clause doesn't apply to an unwritten right, only those specified in the charter. At this point, it is becoming increasingly difficult to have a serious campaign, even for those who had registered early. Personally, though I always play to win, I cannot start my campaign until September 24, and that is assuming everything will go Doug Ford’s way. As such, I am making my main goal to get people talking about direct democracy. I wish everyone good luck and encourage other citizens to consider running as well! Thank you for commenting and please feel free to do so on my Facebook page, at facebook.com/AndreiZodian as well!